SMM Buzz: Twitter Account OR Terror Messenger!!! Twitter Account OR Terror Messenger!!! What? Terror groups are now using social networking sites like Facebook, twitter to get worldwide attention!!! I don’t believe this! If you don’t believe then you must read this blog. Remember Bodh Gaya serial blasts in Bihar? It was the done by Indian Mujahideen (IM) and they claimed it via their official twitter account! This is horrible isn’t it? This IM’s twitter account has claimed to be “real” account of jihadi and IM group. Immediately knowing this bitter truth twitter took quick action by blocking this terror account. 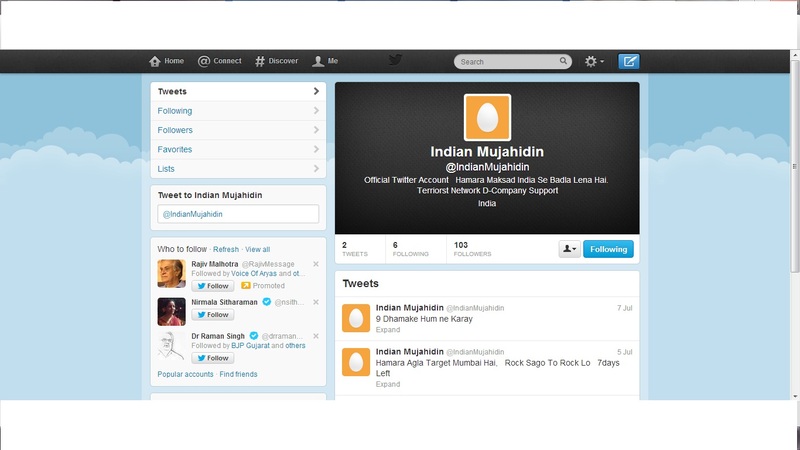 "The account — @IndianMujahidin — is suspended for violation of the Twitter rule," said a senior government official. But the terror group is much more faster than twitter group and created another account and even taunted by tweeting "Dekhte hai tum log kitne accounts block karte ho” (let's see how many accounts you will block). This is really scary!!! All social networking sites must take serious action about this or else social networking sites may turn out to be the social terror networking sites!!! Easy Ways To Do Effective Search On Google!!! Social Networking Sites For Kids!!! How Brands Adopted Hashtags on Facebook!!! Did you see Gmail’s new look? This is how facebook graph search looks!!! Now, it’s the time for Twitter Update!!! Latest and Interesting Updates From Facebook!